Indira Gandhi Centre for Atomic Research (IGCAR), Is Recruiting 130 People For Trade Apprentices, Under Apprentice Act Of 1961. So Interested & Eligible Can Apply For This Job Through Online Mode, Within The Given Time. 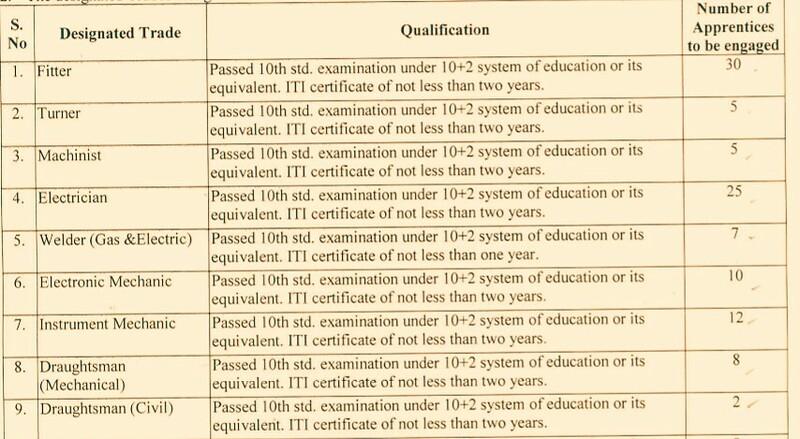 Trade Apprentices →130 Vacancies, Kindly Do Check Out The Images Below For Name Of The Discipline, Educational Qualifications, Educational Qualifications. B. Eligible Criteria For Trade Apprentices Job In IGCAR Recruitment Notification 2019. Age Limit → 16 To 22 Years. Mode Of Examination/Selection Process →Through Interview. Last Date For Online Application Form Submission →24th Of April, 2019, Upto 5:00 P.M.
For More Info →The Official Website Of Indira Gandhi Centre Of Atomic Research, India. Now Apply For This Job Of Indira Gandhi Centre Of Atomic Research Recruitment 2019.